We are releasing version 1 of the Blockpit platform! Today we are setting another milestone for Blockpit but also for the crypto community this step should bring a big relief. After about a year of developing and refining the beta version, a first full version is now online, which will be accessible to everyone via a subscription model. The most important question in this context, however, is what v1 offers. Here is a brief overview of the most important functions in the subscription model and why you should not miss them under any circumstances. When it comes to finances, of course, nobody wants to have an error in the calculation, especially if there exists the threat of the tax authorities knocking on the door. 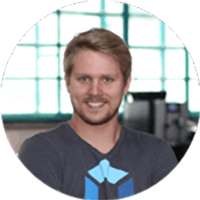 To ensure that all errors in Blockpit's documentation are detected and corrected in time, Version 1 includes so-called error handling. If an error is displayed, the error log tells which coin/token in which amount, period and in which widget has been entered falsly or is missing. This way, you quickly and directly can detect problems in your transaction history and can resolve them independently with just a few clicks. The legal situation in Austria and Germany allows you to choose your preferred calculation method. 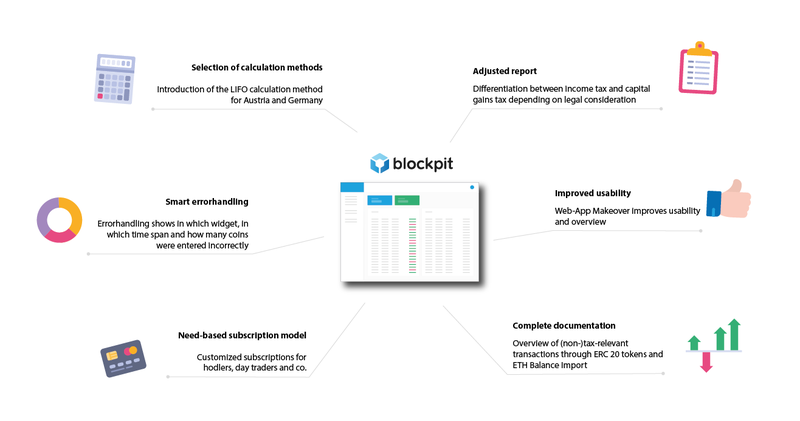 Even with Blockpit, you have the choice of which method to chose to calculate your tax burden. Already in the beta version the calculation with FIFO, HIFO and an optimized method was possible in Austria and the calculation according to FIFO in Germany. Version 1 adds LIFO - last in first out to this selection. In addition to the calculation in Austria and Germany, further countries are already integrated in the background of the platform, so that correct calculations can also be carried out internationally in the future. Note: Please check whether the calculation method used is permissible in your respective country. On the Internet, opinions differ on the permitted calculation methods. If you are not sure what to use, especially in Germany, please contact your local tax office. Only a complete overview of transactions and balances allows you to be sure that nothing has been forgotten and everything is fully correct. This is why the new version also allows ETH Balances to be read via the Ethereum Blockchain, even though they are not tax-relevant. 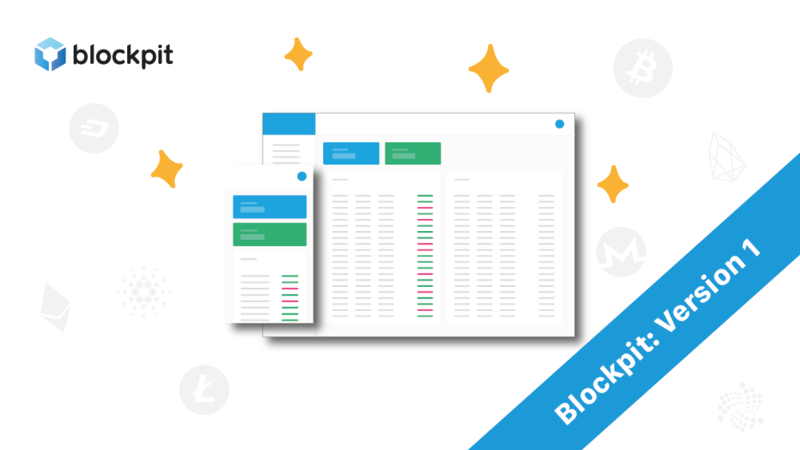 The new input mask, which has been online since December 2018, enables you to document all transactions with cryptocurrencies and thus you obtain a complete history. You may have often asked yourself when which coin falls out of the speculation period? We now have the solution. Depending on the chosen calculation method, Blockpit shows you the most important information for each tranche. This includes the time of purchase, information about the amount of the respective coin and the date when the coin falls out of the speculation period. The ultimate function for all Hodlers and occasional traders or those who simply want to sell tax-optimized. In order to visually round off all new functions, we have also redesigned the platform in recent weeks. It now appears in a similarly bright and modern design as it is already known from Blockpit's external appearance. But we also focused on user experience and the feedback we collected during the last year in order to offer you the best experience possible. Understandably, additional functions and further progress of the platform require support and further development. We still have big plans for which functions and services should be offered on the Blockpit platform in the next months and years. In order to be able to offer this service to our users, version 1 will be converted to a subscription model. Depending on how many transactions and widgets are required, there will be a suitable price package for each crypto type as well as a selection of additional packages to tailor the platform to individual needs. All pricing information can be found on our pricing page and we are always ready to answer your questions. Important: The data of all our beta users will, of course, be transferred when you upgrade to version 1! We are looking forward to the next weeks and also to any feedback from you. In addition to the release of the web platform we can announce the revised mobile app, which you soon will find in the App- and PlayStore. More information about the functions of the mobile app and details about the web platform will follow in our blog. So stay tuned! After version 1 there is still no end in sight. Our developers are already working on further functions, for example a general CSV import which is planned for the next version. Until then we are looking forward to your opinions and experiences with version 1, so that we can continuously develop it further according to your wishes. You will also find a more detailed look towards the future in our roadmap.